A dry cough, also known as persistent dry cough, and productive cough are of two types. A productive cough is usually experienced with phlegm or mucous-whilst coughing and should not be suppressed. Phlegm is the gunk that the body needs to get rid of. Persistent dry cough, on the other hand, usually occurs together with a tickly cough and is usually caused due to allergy or by viral infections. Unlike a productive cough, a dry cough does not produce any phlegm or mucous. Since persistent dry cough is caused by viral infection, it is important to understand the underlying problem before discussing the remedies of the same. A dry cough can be triggered by cold, flu viruses and other atmospheric pollutants that irritate the throat. Dry coughs usually result due to irritation or inflammation at the back of the throat. Also, it can sometimes arise deeper in the chest. Persistent dry cough not only irritates but also disturbs sleep pattern. Let’s understand the common problems that cause persistent dry cough. Viral infections –Commonly known as cold and flu, viral infection causes coughs that occurs at the start or middle of an illness and lingers on even when other symptoms of the infection have subsided. Allergies –Allergies are also seen to be behind dry coughs. For instance, Hayfever, an allergy to tree pollen and grass, leads to eyes and nose irritation and is often seen to lead to coughs. People who are sensitive to other particles like animal fur, which is termed as allergic rhinitis, are at risk of developing this symptom. Air pollutants –It is often seen that air pollutants often irritate the back of the throat. This can give rise to dry coughs. A simple example of this would be a non-smoker entering a smoking room. The pollutants resulting from the smoke can irritate and cause the person to cough continuously. Acid reflux – Acidic contents present in the stomach moves upwards to the back of the throat, and some can make their way in the respiratory tract. This causes inflammation in the back of the throat resulting in constant coughing. Acid reflux is a noticeable element of GERD (Gastro-oesophageal Reflux Disease). Medication – some medicines, like those prescribed to control high blood pressure, have their side-effects and can result in a dry cough. Psychological conditions – Referred to as psychogenic cough, there is no bodily illness behind a cough. In this case, coughing is more of a habit and goes away when the person is asleep. Stress – Stress has seen to have a direct impact on coughing. In a stressful situation, anxiety is seen to slower the breathing process thus triggering the cough reflex. Asthma – A recurring disease, asthma causes the airways to become inflamed, and these get partially blocked. Heart disease – Heart problems lead to building up of fluids in the lungs that can cause heart failure. People suffering from persistent dry cough should get it immediately checked. 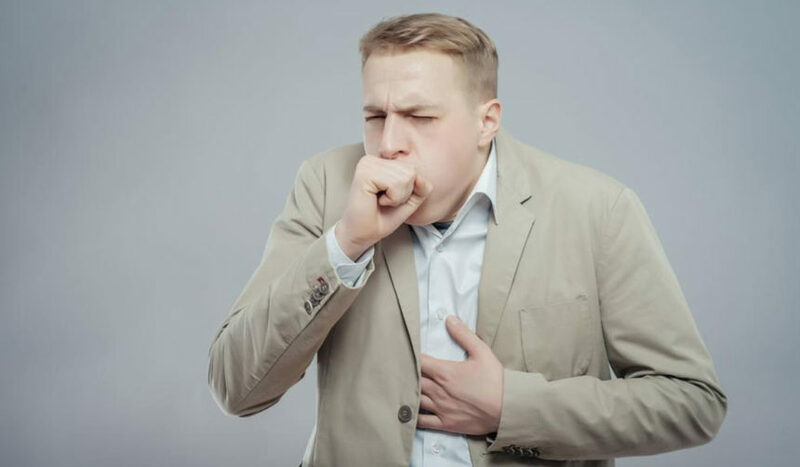 A whooping cough – Bordetella pertussis is a known cause of this bacterial disease which is characterized by stints of coughing which leaves the person gasping for air. Tuberculosis –Predominantly affecting lungs, TB is a highly infectious bacterial disease which gives rise to dry a cough. Honey–Honey is a wonder product as has properties that help in calming a sore throat. Honey works better than over-the-counter medication and is efficient to calm a dry cough. A rich demulcent, honey has high viscosity, and its gluiness helps in coating and soothing the irritated mucous membranes. Honey is also loaded with antibacterial properties which help kill the bacterial illness and shortening the prolonged dry cough. Licorice Root Tea – An expectorant as well as a demulcent, Licorice root soothes airways and simultaneously helps in easing the congestion by thinning and loosening the phlegm. Gargle Salt Water–Gargling with salt water is a traditional remedy passed on from generations. It helps in easing sore throats and relaxes the inner muscles. When salt concentration is higher outside of the cells in the mucous membranes, water automatically flows out of the cells to maintain the balance. As soon as the water goes out, swelling subsides, and inflamed tissue gets to rest. Steam with tea tree oil – steam is most effective and helps in loosening the mucous immediately. Tea tree oil is loaded with anti-bacterial, anti-viral properties that are excellent for soothing and opening the airways. Eucalyptus oil can also be added to fight off a virus or bacteria. Ginger Peppermint Syrup – Soothing properties of ginger combined with healing properties of peppermint works wonder for a dry cough. Ginger helps in loosening and expels the mucous from the lungs. It also reduces the irritating tickle caused by persistent coughing.